With a load capacity of 350 kg, the Powered Ultimate Lite has central drive with push-button lift and drive, and removable caged sides. It features both a powered lift and powered drive system, removing the need for manual pushing or lifting. Equipped with the central drive wheels, it is suitable for confined spaces. 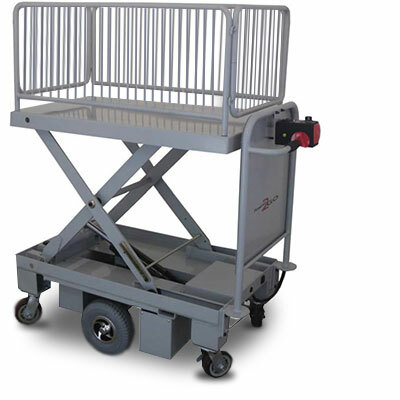 With a lift height of 1000 mm and a fully removable cage, the unit is ideal in many applications such as hospitals, archival areas, libraries, stationery warehouses, and safety manoeuvres loads to various work heights. Fitted with 250 mm diametre semi-pneumatic grey non-marking drive wheels and 125 mm non-marking polyurethane castors—two swivel, two swivel with brakes—for added manoeuvrability, stability and safety. Powered drive system – removing the need for manual pushing. Central drive wheel enables high manoeuverability – ideal in confined spaces.